Men look me over on every city street. with all our heartfelt plans. and tell me what he is thinking. Walked into a waiting room filled with glowing girls. Oh, how I hate you. Did you find your father yet? with my thin gray veil of broken belief. Can you believe I'm still at it? I have too much career at stake. When I come back I am a little more dead. I have escaped the normal fate. You know. and wondered why I was still trying. before I could grab it again. I've found a place among them. We are not in Mexico anymore. to get a Diet Mountain Dew. I thought I heard them. Do you know that smell? There is no mistaking or escaping this. To render weightless what I bear in what I've seen. There was a Snoopy poster on the ceiling. I am an algebra student. inside I nurse you still. 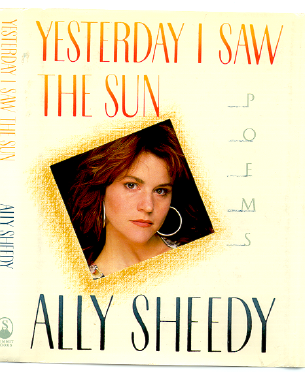 Methodology: This poem consists of one random line from each page of Ally Sheedy's Yesterday I Saw the Sun (Summit Books, New York, 1991) between pages 19 and 140, inclusive. Titles counted as line number 1; if there were too few lines on a given page, the random number was taken modulo the number of lines.